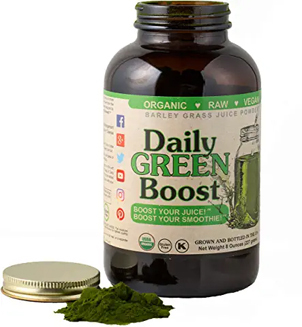 Daily Green Boost is a "green powder" nutritional supplement. And it's one of the good ones. It's made from the juice extracted from barley grass, the juice then being dried into a powder at low heat so as not to damage nutrients. And this is not the same as consuming powdered barley grass (not advised). Although not in pill form, it can be considered a "multivitamin", and should be taken daily for optimal health. It is advised to add it to a smoothie and not to water (better absorption/utilization that way). I add it to a banana smoothie. Personally, I use two heaping tablespoons a day (four bottles per month). You can also mix some with a little water, just enough to make a paste, and then spread it on fruit or veggies. Even though it tastes good by itself, it's best to mix it with other food. Barley grass is not the same as wheat grass. Indeed a whole book is devoted to the differences between the two. A notable difference I'd like to mention is: if you consume an amount of wheat grass juice that will make you throw up, the same amount of barley grass juice will not. So obviously, they are not the same. If you want more specifics, they're here. I have used the recommendation of this product in my practice with great success, and there are hard science reasons for this, and the empirical evidence can't be argued with (well, it can be, usually by people who don't want to believe that we need to take a nutritional supplement). Q: What are your thoughts on the ____________ version of powdered greens called _________. Its the product Ive been using for many years now and I'm just curious if youve tried it and what you think of it. 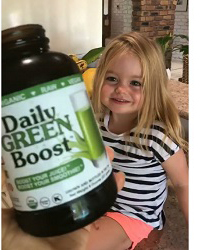 A: As part of my due diligence, I personally participated in independent testing of many of these green powders along with Daily Green Boost (to see if what's printed on the label is really in the bottle, to compare amounts of nutrients per gram, and if there was anything in the bottle that shouldn't be, like heavy metals), and DGB came out on top in all categories. And while ___________ is better than nothing, there is better, and there are things about it that I feel shouldn't be in a green powder. So IMO, money is better spent on DGB, especially considering you get more "powder for the buck" because the two markups are very different. And if you use this daily as we should, and if you use a minimum of two heaping tablespoons, a lower cost per gram is important. NOTE: I'm providing these links below as a service; I do not make any money from you purchasing this product. And I believe in doing business with good companies that deserve our dollars, and the company that sells this product is one of these companies. 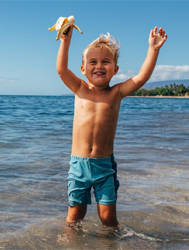 By the way, kids love it too, and kids are the toughest critics of all.